The amounts represent payments by a national government actually made, or to be made, during the course of the fiscal year to meet the needs of its armed forces, those of Allies or of the Alliance. Equipment expenditure includes expenditure on major equipment as well as on research and development devoted to major equipment. Personnel expenditure includes pensions paid to retirees. The cut-off date for information used in this report was 2 July 2018. Figures for 2017 and 2018 are estimates. Click here for the full report (15 PDF pages), on the NATO website. The leaders of 29 NATO Allies and many partner nations will meet in Brussels on Wednesday and Thursday (11 and 12 July 2018) for a Summit at the Alliance’s new headquarters. Together, they will take decisions to strengthen NATO’s deterrence and defence, step up in the fight against terrorism, and achieve fairer burden-sharing. 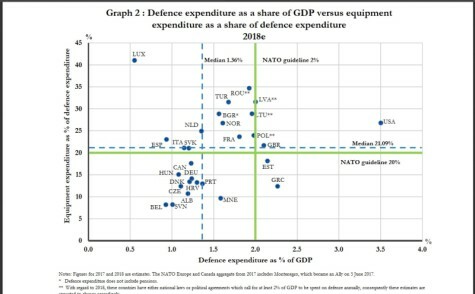 On Wednesday, defence spending and burden-sharing will be high on the agenda. 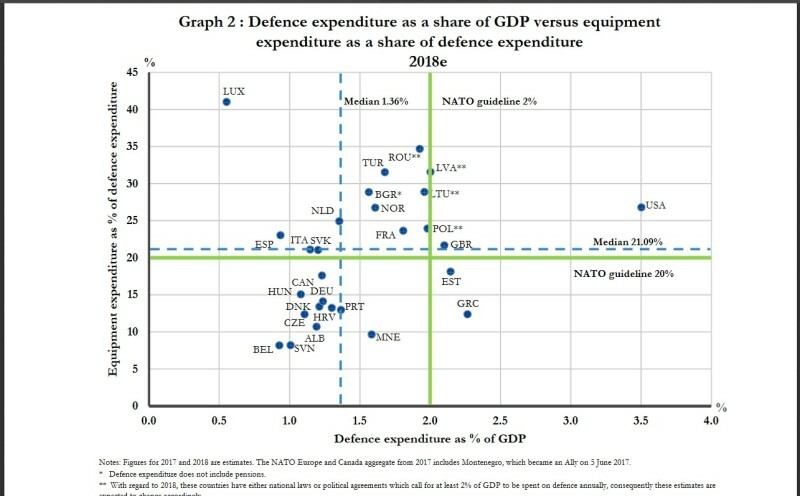 In 2014, NATO Allies agreed to stop the cuts, start to increase and move towards spending 2% of GDP on defence within a decade. Since then, Allies have made major progress. “We expect 8 Allies to spend at least 2 percent of GDP on defence this year, compared to just 3 Allies in 2014,” said NATO Secretary General Jens Stoltenberg. He noted that Allies are also investing billions in new equipment and stepping up their contributions to missions and operations. “We estimate that European Allies and Canada will add an extra 266 billion US dollars to defence between now and 2024,” he said. Leaders will also take decisions to step up NATO’s role in the fight against terrorism. They will agree to launch a new training mission in Iraq, with hundreds of NATO trainers. Military schools will also be set up to increase the professionalism of Iraqi forces. In addition, Allies will agree more support for key partners in the Middle East and North Africa, including Tunisia and Jordan. To strengthen NATO’s deterrence and defence, leaders are expected to adopt a Readiness Initiative – the ‘Four Thirties’. “This is a commitment to have by 2020: 30 mechanised battalions; 30 air squadrons; and 30 combat vessels, ready to use within 30 days or less,” said the Secretary General. Allies will also agree a new NATO Command Structure, including a new command for the Atlantic in Norfolk, Virginia, a command for military mobility in Europe in Ulm, Germany, and a Cyber Operations Centre. In addition, Allies will discuss NATO’s response to hybrid threats and agree to set up new counter-hybrid support teams to help Allies at risk. Allies are also set to invite Skopje to start accession talks. Once the historic agreement on the name issue is finalised and implemented, NATO will be able to invite the former Yugoslav Republic of Macedonia to become NATO’s 30th member under its new name: the Republic of North Macedonia. Later on Wednesday, Allies will address key security challenges with leaders from Finland and Sweden, as well as the Presidents of the European Council and the European Commission. Leaders will also meet with close partners, Georgia and Ukraine, on Thursday to discuss regional challenges, defence reforms and NATO’s continuing support. The Summit will close with a meeting on Afghanistan, where NATO Resolute Support partners will join Allies. “Our presence in Afghanistan is vital to ensuring the country never again becomes a safe haven for international terrorism,” said the Secretary General. Leaders are expected to agree to extend funding for the Afghan forces beyond 2020 and express their support for President Ghani’s peace initiative and reform efforts. This is NATO’s 29th Summit. The first one was in December 1957, and the most recent took place in Warsaw in July 2016. The Summit is the seventh hosted in Brussels, and fifty-four official delegations will participate. This includes all 29 NATO Allies, 20 partner countries and representatives from the United Nations, the European Union, the World Bank and the NATO Parliamentary Assembly.